An early start of the season for whale shark tourism looms here as the “gentle giants of the ocean” have already started public appearances about three months ahead of the regular peak period. 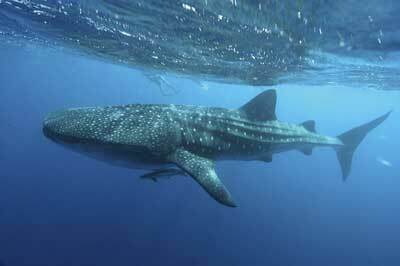 As in the past years, the peak season starts February going through May, the period that groups of whale sharks, locally called butanding, would arrive from somewhere in the ocean and stay near the mouth of the Donsol River to take advantage of the continuous abundance of plankton that fill their diet, to mate and even to breed. This species of giant sea mammals, scientifically called Rhincodon typus, is a slow-moving, filter-feeding shark and the largest extant fish species -- reaching as big as 13 meters in body length and weighing more than 21 metric tons -- are migratory in nature but some of them have already adopted the Donsol waters as residence. This resident group composed of around eight fully matured butandings would stay behind and continue entertaining tourists and visitors until September then disappear from public view and stay not farther than the nearby Manta Bowl to wait for their next season. The Manta Bowl is a deep portion of Ticao Pass that is a sanctuary of manta rays, an equally-protected marine wildlife species. As early as November, however, they started appearing off the shorelines here and of the adjoining Pilar town, signaling an early start of whale shark interaction that the local government offers to tourists and visitors who have actually started coming around on the first news of sightings last December. “All our eight resident butandings have already reclaimed their Donsol sanctuary earlier than we expected. They would even go around through the waters of Pilar as if announcing to the public their early return,” according to town mayor Jerome Alcantara. “Their early appearances tell us here that we are also on to earlier busy days, catering to the needs of thousands of tourists coming around to have a once-in-a-lifetime experience of communing and interacting with our gentle giants, a nature’s gift that we treasure a lot,” he said. Alcantara said that last year, 40 visiting whale sharks joined their eight local counterparts at the Donsol sanctuary to the excitement of around 60,000 tourists and visitors who arrived even as the season was cut short by their early disappearances due to the intense heat of summer. They cut the peak season by about a month by leaving in early May last year to find cooler waters elsewhere. The eight locals temporarily joined the original residents of the Manta Bowl, a normal attitude of these sea mammals every time the temperature of waters here goes unbearable for them, Alcantara said.